Vinegar Hair Rinse removes impurities and rebalances hair while leaving natural oils intact for a weightless finish without drying or stripping. 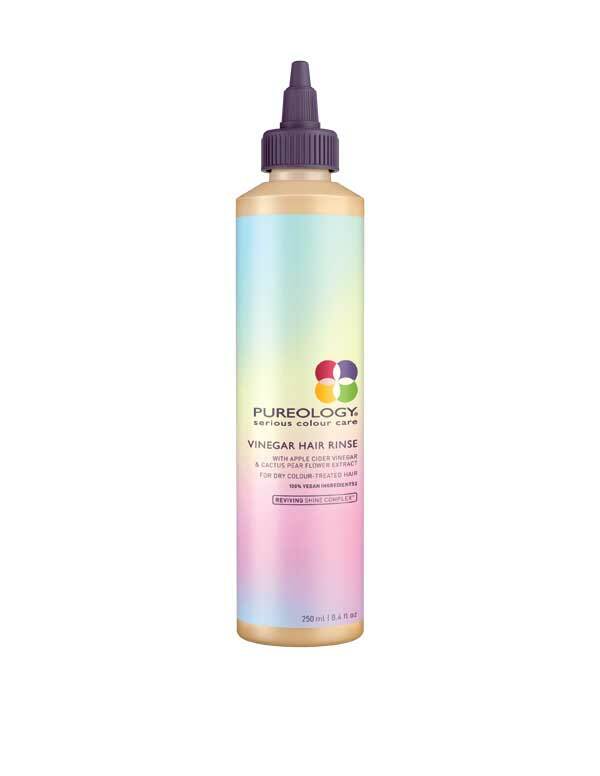 Offering a professional solution to do-it-yourself vinegar hair treatments, women can experience the benefits of superfoods while experiencing superior color protection and the smooth, detangled hair expected from Pureology. Two key ingredients in the exclusive Reviving Shine Complex – apple cider vinegar and cactus pear flower extract – help make Vinegar Hair Rinse a must-have for women. Apple cider vinegar cleanses strands and removes product buildup and mineral deposits while Cactus pear flower extract is a potent antioxidant that naturally maintains the hairs’ moisture. Rich in omega fatty acids and vitamin E, cactus pear flower extract adds shine and hydration for healthier looking hair. To use, first shampoo hair with the Pureology system of choice and squeeze out excess water from hair. Spread Vinegar Hair Rinse throughout hair and wait 2-3 minutes while the formula removes buildup and impurities and seals the cuticle. Rinse and resume usual haircare routine. Use 1-2 weekly to maintain results.